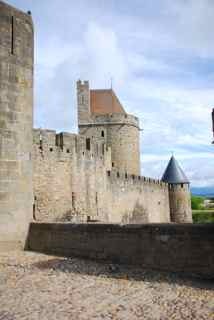 Last night I arrived in Carcassonne and had some time for a little wander around before settling in a lovely little restaurant for dinner. It's a gorgeous place, exactly what Disney would like to be, but never can be. The camp site was outside the main city, and only after checking in did I discover that there was a nest of 'vans parked up in a designated overnighting area near the main gates. Although it was very very tempting to stay local and see the city in the early morning, the call of showers was stronger! 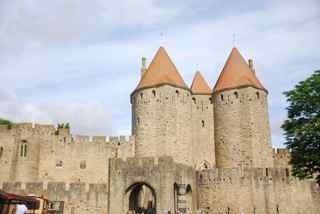 The fortified city itself consists essentially of a concentric design with two outer walls with towers and barbicans to prevent attack by siege engines. 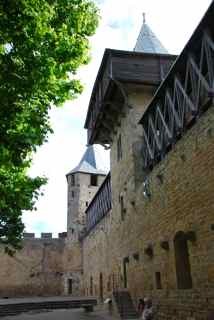 The castle itself possesses its own drawbridge and ditch leading to a central keep. 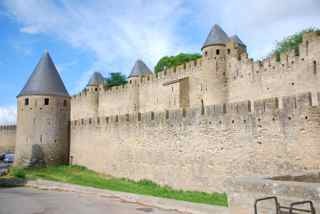 The walls consist of towers built over quite a long period. One section is Roman and is notably different from the medieval walls with the tell-tale red brick layers and the shallow pitch terracotta tile roofs. One of these towers housed the Catholic Inquisition in the 13th Century and is still known as "The Inquisition Tower". The architect Eugène Viollet-le-Duc, already at work restoring the Basilica of Saint-Nazaire, was commissioned to renovate the place. 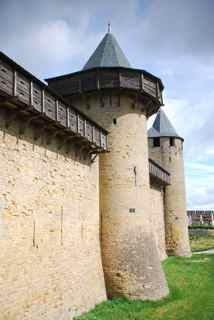 In 1853, works began with the west and southwest walling, followed by the towers of the porte Narbonnaise and the principal entrance to the cité. 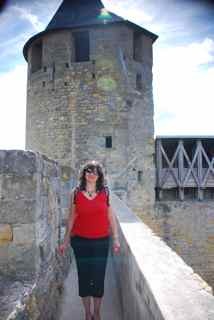 The fortifications were consolidated here and there, but the chief attention was paid to restoring the roofing of the towers and the ramparts, where Viollet-le-Duc ordered the destruction of structures that had encroached against the walls, some of them of considerable age. 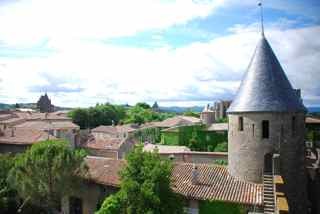 Viollet-le-Duc left copious notes and drawings on his death in 1879, when his pupil Paul Boeswillwald, and later the architect Nodet continued the rehabilitation of Carcassonne. I decided to go for a picture opportunity , so here's the traditional strained looking poses trying to smile engagingly for the camera , whilst you wonder if the nice stranger you just handed your expensive gadget to is going to leg it, and if he does, if you can catch him before you lose sight. I hoped the ramparts might act as a limiting factor! I couldnt leave before having had lunch so I ordered a 'light' local snack and salad - personally I dispute the definition of 'light' but was definitely well gruntled on completion! 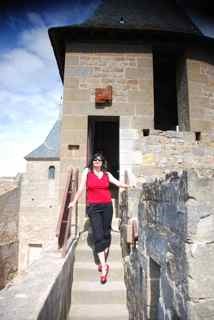 Oh, we should have thought earlier that your route would lead you to Carcassonne - I can recommend a very good wine bar! 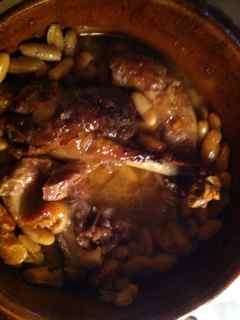 We stayed there for a week (with a car for a few days to escape the tourist hoards) and I don't think we had a bad cassoulet....Hope you had time to take a stroll along the Canal du Midi as well - see it now while there are still some mature trees left! I am a crafting, cooking house renovator, living in the Netherlands. Join me as I do a full renovation on an 18th century Dutch farmhouse. You can also find me on Facebook at Rae's Nomady blogger page. google-site-verification: google8d6d6d632c1ef29a.html. Awesome Inc. theme. Powered by Blogger.